Populi courses can connect with other LMS software using Common Cartridge and LTI links. Common Cartridge and LTI are non-proprietary software specifications that enables different learning systems to share various kinds of information, and most modern LMS packages support one or both of them. In addition to Common Cartridge and LTI, Populi can also interact with the Canvas LMS and incorporate Tin Can elements in lessons. Common Cartridge lets you export content (lessons, files, tests, etc.) from one LMS for use in any other Common Cartridge-compatible LMS. You would use this method when you have course content stored in Moodle (or any other Common Cartridge-compliant system) that you wish to migrate into Populi. When importing Common Cartridge files, remember that every LMS includes (and excludes) different data in their respective Common Cartridge exports. Populi can successfully import any valid Common Cartridge file, but it is of course limited by what is included on that file in the first place! If you have questions about what is included in your LMS' Common Cartridge export, please consult that system's documentation. Export the Common Cartridge file from your course (consult your LMS's documentation for how to do that). Populi can import Common Cartridge files with the extension .zip or .imscc. You can use Common Cartridge versions 1.0 or 1.1. Go to your Course > Info view. Above Information, click Import Common Cartridge. Locate the file you exported from your LMS and upload it. Select the records you'd like to import. You can import assignments, tests, discussions, links, and lessons. Click the show link to see the content for each item (for example, the questions for a test). If you run into trouble with the import, there might be problems with the source file. You can run your exported Common Cartridge file through this validator to see if there are errors and diagnose problems. When you have all the desired content selected, confirm the import. Get back to your course by clicking Go back to what you were doing. LTI stands for Learning Tools Interoperability. It is a software standard that enables users in one system to jump to other systems without a separate login or app; it also lets the two systems share pertinent information with one another. Use LTI when you're using another LMS or service to provide course content to your students (while using Populi to store the permanent academic record). 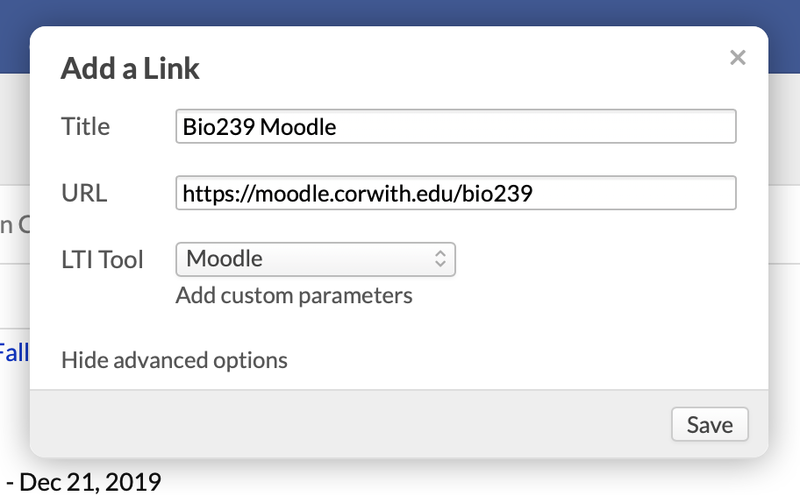 For example, a nursing school enrolls 35 students in a biology course that connects to an LTI-enabled test bank maintained by a textbook publisher: using LTI, the students can log in to Populi and follow the LTI link in the biology course to access the tests. In turn, the publisher passes the grade information back to Populi and automatically fills in the course gradebook. Here's a more technical explanation of LTI. Feel free to skip this part! Populi is an LTI consumer. It is designed to work with an LTI tool provider. Populi handles authentication to the provider and supplies: name, some contact info, user ID, and user roles. The LTI provider uses this information to admit the Populi user with the correct permissions. For example, the course faculty clicks the LTI link and is given test management/grading permissions in the other system. A student clicks the link and is given permissions that let her take the test. The other system, in turn, can then pass the student's grade back to Populi's gradebook. The Populi user's permissions in the other system are determined by the other system's setup. You can set up global LTI tools for use in your courses, add your own LTI tools manually, and link specific assignments so grades can be passed in to Populi from the other system. To set up a global LTI tool, the user must be a Populi account administrator. Go to Account > Account Settings > Integrations. For Integration type, select External LTI Tool. Choose how you'd like to configure the LTI tool. You can use a Config URL, Pasted XML, or Manual Entry. Consult your LTI tool's instructions to see which option you should use and what to enter in each field. Repeat these steps to add additional LTI tools. Now that you've added this LTI tool, it's available for use when setting up an LTI link in any course at your school. Go to the Course > Info view. Select the LTI tool for the link. When you do this, it will supply the URL. Enter the URL and title. Select the LTI tool for the link. Enter the name and value for each parameter; you can enter as many parameters as you wish. Once you save (either method), you now have a link to the corresponding course in the other LMS. For this method, you'll need to have associated an assignment with a lesson. Go to the Course > Lessons view. Select the lesson you'd like to work with. Make sure you've added the appropriate assignment(s) to this lesson! Select an LTI tool; you can also enter custom parameters. 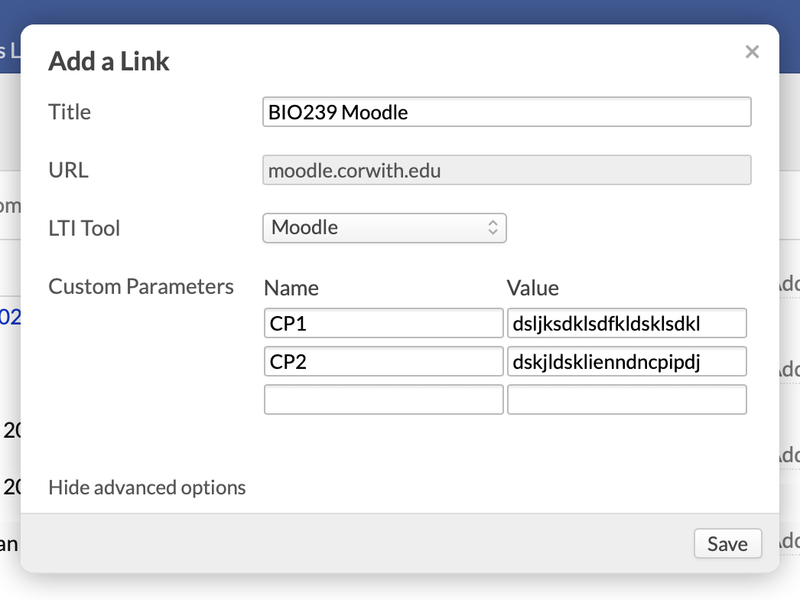 Now that you've added this LTI link, when you enter grades in the other system, it will send those grades to Populi and automatically populate the course gradebook.